AGTER - China-Europa Forum. WT54 – Land management and land ownership policies in ITALY. A contribution of ISMEA. 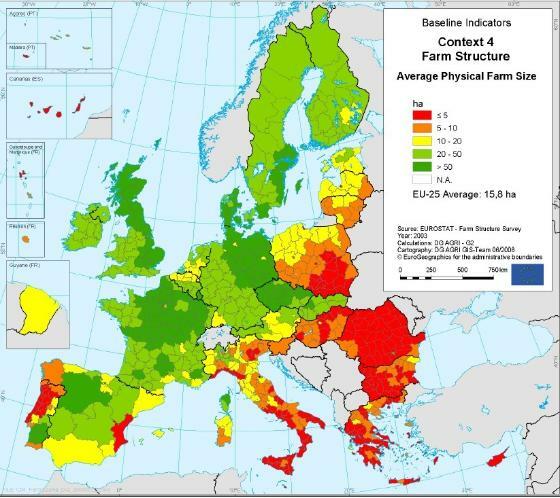 The following picture describes rural structures in Europe and highlights the same structural problems as mentioned above that distinguish several areas in a negative manner. The great structural criticality of numerous Italian areas emerges from an analysis of the picture, with particular reference to the Southern regions. Similarly to provisions regarding other production sectors, also for the agricultural sector it should be extremely useful to provide for a specific action directed to facilitate a structuring of agricultural holdings so as to contribute in real terms to the widest objective of rural development. 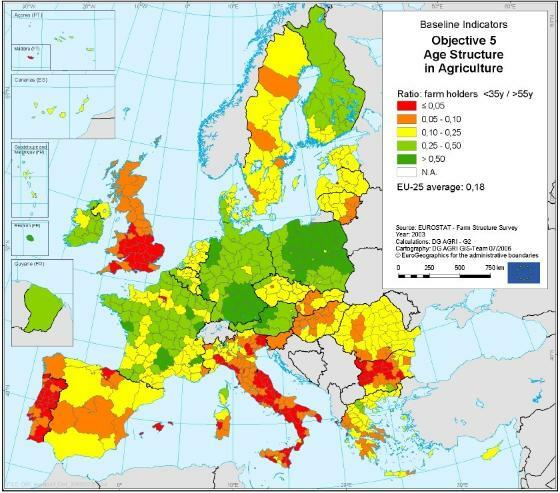 Moreover, the European agricultural model, based on the concept of multi-functionality, environmental compatibility, economic sustainability, food safety, is a cultural model rather than a technical, economic and social one which requires to expand on the analysis of the structural evolution and of the composition of land assets and human resources in the agricultural sector with a view to identifying instruments that allow prospects of development for young people up to the new demands of society, with greater reason in a phase of general reconsideration of the CAP. Therefore, if the human factor is the element that characterizes the development potential of the agriculture on the new scenarios, the need to encourage the installation of young farmers is one of the prerequisites. It is therefore necessary to create the proper conditions to make the installation of young people in agriculture “interesting”. In this context it appears crucial for young farmers to overcome the difficulty in obtaining the purchase of agricultural lands, because of the high costs and the non-availability of land to rent. The difficulties connected to the application in Italy of the benefits deriving from early retirement in agriculture, must be traced primarily to the fact that, besides the cessation of commercial farming activities, farmers had to carry out the transfer of the real estate. It is therefore necessary to identify those procedures that may allow to facilitate the cessation of commercial farming activities, thus contextually encouraging the generational turnover in the agricultural sector, and making agricultural areas available by using all existing instruments (purchase, tenancy, and so on). The critical aspect regarding the inadequate presence of young people in agriculture has been evaluated at European level by taking into account the rate of generational turnover that shows exactly the ratio between farmers who are less than 35 and farmers who are more than 55 years old. In the following picture Italy is reported as having vast areas of criticality. the access to medium- and long-term credit for young farmers. d. to improve the transparency of real estate market, thus representing a useful reference point with respect to land price quotations (“price-control effect”). ISMEA (Istituto di servizi per il mercato agricolo alimentare), is an Italian public economics body which was reformed in 2000 whit the unification of the Fund for the consolidation of the farm land property by the Institute for agricultural market analyses, research and information. New insurance and financial instruments and services for farmers and farming associations. Throughout Italy, ISMEA is involved in land reform in compliance with regional programming objects regarding agricultural and agro-environmental policies. transparency and mobility of the rural land market. In order to implement land aims subject to the opinion of the relevant regional body, Ismea purchases land suitable for reform, development and expansion of farming property, carries out the division into lots and, if required, puts into effect or promotes the required land reform and sells the land to individual farmers or to members of farm lease-hold cooperatives, with subsidised loans, six-monthly repayments over a 30-year period, tax relief and conditional right of domain. technical and financial help for initiatives, with particular reference to technological innovation, crop orientation and conversion to alternative products and enhancement of the environment; in order to implement these aims, it participates in activities promoted by organisations that provide services for farming businesses. Ismea, to encourage the privatisation of public land suitable for farming, acts as an advisor. Specifically, when appointed by the administrations involved, it evaluates the land and takes direct action in its purchase and sale. It also produces a land reform project based on the typical criteria of the activities involved. The object of the land intervention programme envisaged by the regions in Regional Operational Programmes, is the development of the territory through the business training. Maximum support limits for interventions of this kind are established by the EU. Within this context, Ismea acts as an institute at the service of the regions, operating in the area of regional programming through special meetings with the individual regions in order to define operational methods based on the various territorial situations. Priority criteria to obtain support under forty farmers. Other priority criteria to be defined in accordance with programs envisaged by regions (attenments, income level, environnement respect etc., market analysis). Up to 750.000,00 Euro for each “single farmer”. Up to 2.000.000,00 Euro for co-operative farms. tax relief (reduction of contract registration duty). Ismea revolving fund (annual payments made by assignees). mortgages granted by the deposit and loan bank (State bank). average investment per farm 375.000,00 Euro. post-assignment technical and financial assistance. intervention on behalf of farming businesses. guarantees (Legal guarantee can reach 4/5 of the farm value after investments).